Excuse me, what did you say exactly? Do you recognize this? Of course! This is you, the moment you are getting overwhelmed with marketing messages from all different kinds of organizations. 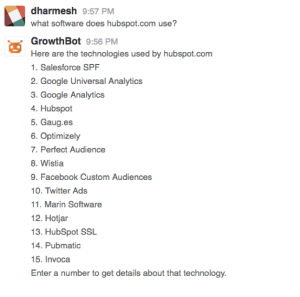 Banner ads, push notifications, sidebar affiliate links, oh my! Or to put it another way, old-fashioned marketing. Times have changed and nowhere is that more apparent than in the marketing world. Old marketing is dead. Of course, that means that there is a new type of marketing campaign. Yes indeed! And that’s what we’re going to be talking about – new marketing, or what the youths are calling Interactive Marketing. Cue the lights, let’s dive in. What Is Interactive Marketing Exactly? These kinds of advertisements that you skip most of the time (or don’t even notice!) are advertisements that work in one direction. ‘We send out an ad and hope you see it’, this way of thinking still thrives in a lot of organizations but it’s just not effective anymore. What companies need is interactive marketing, campaigns that result in a two-way dialogue with the consumer. The best interactive advertising campaigns involve initiatives triggered by a customers’ behavior. That is why this approach is sometimes called “trigger marketing”. You set up a campaign and you DON’T wait. See how customers are reacting to the campaign. For example, are they engaged? Are they viewing your content and clicking to learn more? Are they spending more – or, gulp, less – time on your site? You adapt and try to meet their expectations WHILE the campaign is still running. And we already loved the internet so much, but now? Advanced technology gives you a total overview and extremely detailed insights into your customers. So if I was you… Go and interact! There are countless ways of interacting with your customers and practice interactive marketing. I’ve picked some key interactive marketing strategies that you’ll probably recognize already and some cool ones you might not be familiar with. Creative forms of interactive digital marketing on the whole and infographics, in particular, are being used as part of a wider search and content marketing strategy. They are powerful tools for SEO and PPC agencies to increase site relevance, engage with users and attract links. Infographics are excellent examples of engaging content. When a company published a well-designed infographic on its site, others post it on their own sites, more websites are linking back to it and sharing the infographic, as a result, the company gains more organic traffic. That’s why the topic of your infographic has to be absolutely groundbreaking, informative, provide practical value to your audience – and excite them. And with today’s technology, it’s fairly easy to create interactive visualizations of your data that allows your audience not only to watch and learn but to engage as well. 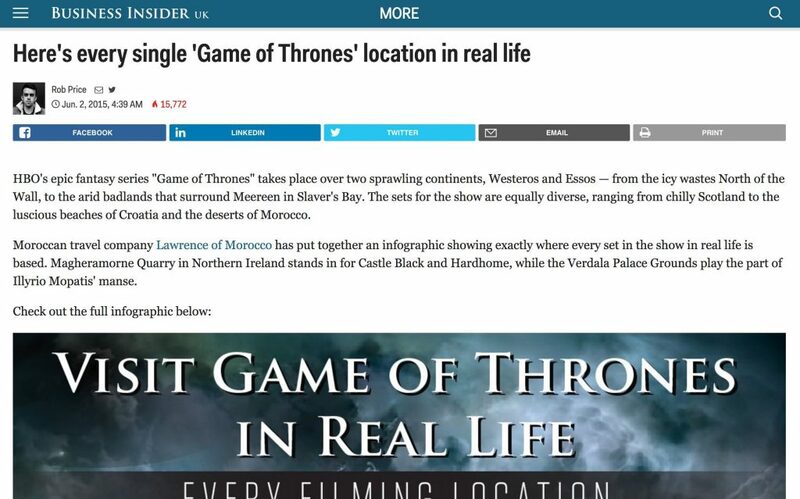 This infographic case study is a great example: a visually appealing map with all the filming locations of Game of Thrones. They made it for one of their clients: a travel company. Since much of the series was being filmed in Morocco, it was a great hook that synced nicely back to the client’s Morocco offering. Don’t have a clue on how to get started on your own infographic, just follow these best practices. Why did it work? By creating something tangible/physical to give them, you’re also minimizing the amount of work they have to do. They can write a paragraph or two, add your map/infographic/video and there’s a story ready-made. For writers who are being asked to publish multiple stories a day, that is a godsend. YEP! We are interacting right now! Blogging is one of the most used interactive marketing types, especially for digital companies. 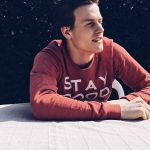 Fun and short blogs to keep your customers posted and keep them up to date about the last new deals and interesting tips and tricks. Good points for Survey Anyplace! All this is what we call interactive storytelling. One of my FAVORITE types of interactive marketing! Name it, and you can do it. You can go as far as you want with interactive storytelling and that’s what makes blogging interactive. HOW FUN! According to Martechadvisor interactive storytelling is the best marketing. It is true what they say. Stories are a human thing since the first day we started communicating. People don’t easily ignore that. Interactive marketing by way of storytelling decreases the boundary between the customer and producer. It also makes it a lot easier for the customer to make its decisions. Here are some amazing examples of interactive storytelling! Ever heard of Cicada 3301? If not, you’re certainly not the only one. But this is not a case of bad marketing! you never heard of it because 99,99% of the people on this planet aren’t the target market. The CIA was looking for some very gifted encoders but there was only one small problem: Where do you find these if only 0.01% of the population has the skillset you need? To do this they created a kind of game that only the most skilled people could play. With a lot of clues, they created an online puzzle. Every time you solved a clue, you got a new one. See this smart strategy in action. Inviting users to share their own content is one of the best examples of leveraging interactive content. This approach usually works best on social media, often accompanied by a hashtag, and is a fantastic way to shine a spotlight on the brand’s target audience and allow customers and prospects to see themselves represented. Jimmy Fallon provides a perfect case study on user-generated content. A normal segment in his show includes him reading viewers’ social media posts according to a certain hashtag prompt. Gamification. I could try to explain this AWESOME example of interactive marketing to you with endless theories. But I won’t. What a brilliant way of doing interactive marketing. This is something that people will remember and link with the brand that has given this experience to an unexpecting crowd. This Asics marketing campaign was launched in 2011 and the results after that year were incredible. The overall sales increased by 15% and the sales of footwear, what this campaign in particular is about, had a rise of 20%. So very short: Gamification is mixing ‘game-like’ elements in a non-gaming environment. It is all about stimulating a behavior of human beings starting from the intrinsic motivation or the motivation from within an individual. EEUM… you are reading my blog SOOOOO you obviously know I’m from Survey Anyplace! I would be surprised if you wouldn’t want to see more. Go and check Some more extremely cool ways of gamification. Maybe more in your comfort zone is Facebook. It is possible to target the people you want in a million ways. You have probably seen it a lot. Advertisements on Facebook which make you think: DAMN this is useful! It is because you are targetted for those nice sneakers you looked up earlier that week. Targeting is based on previous behavior and interests. 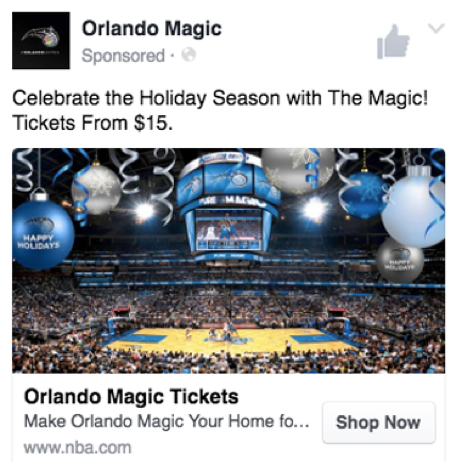 A great example of social media targeting is the campaign of ‘Orlando magic’. We sit here behind a computer so at least we can talk about sports! Orlando Magic was a campaign of basketball team Orlando to get people to a game during the holidays. They used specific segmented groups to send a more personalized link to their fans and made sure that the ‘magic’ of Orlando was clear and visible. The results were also magical! The return on advertisements was 52 times bigger than normal!! If this is not really your taste, here are some other great social media marketing strategies. Let’s stay on Facebook. It happens many times, with all of us. We test which car suits our personality best or how good we are with completing the lyrics of those rock bands we know because of our parents. It’s not that the makers are really interested in who your celebrity crush would be or what kind of bread you are. HA-HA! Nope, I didn’t make that up! Quizzes are a great method to use in your interactive marketing process because they’re easily shared and easy to fill in quickly. Using quiz software to create easy, personalized mobile quizzes suits two goals – delivering a custom experience for the respondent and making it easy for them to respond wherever they are. You are an individual. So you want to be treated as one. This gives followers the possibility to feel like they are different than ‘normal’ people because they are exactly the person that can solve a quiz that can only be solved by 1% of the population. These quizzes are such a good source for marketers. While you are telling your audience which kind of bread they are, you collect a lot of information about the user and that gives you a better insight into the needs of your clients. Forget Optimus Prime, Forget R2D2 and forget Bender! I got something way more spectacular. And real! Companies are using their own bots or online bots these days for their marketing or their customer service. This is a real HOT item ladies and gentlemen, even so hot that there are now organizations with ‘shops’ for bots. For example Kik or Telegram. Some of them are very basic and send only your daily horoscope or give you instructions for transferring money to other people, Others are way more complicated. Even some social networks are jumping on the bot-bandwagon. With Facebook, for example, offering an automatic answering bot in messenger for company pages. The important takeaway here is that your goal should be to become as personal and responsive as possible. Especially in this millennial day and age, marketing should be taken to a whole new level of “personalized” conversations. Marketing, it’s all fun and creative and especially interactive marketing is really entertaining. But the underlying goal is not to be amusing of course. The fun side is mostly the advantage for the consumer. We like it, we share it! When you, as an organization, make sure that your content on social media is entertaining, people will share it. If they are more satisfied and engaged they will be more willing to share it with their friends. A real strong campaign of this was Marvels’ campaign of Deadpool. They made it happen that there were emojis based on the movie. People used those emojis and started Talking about them. Don’t we love the magic of social media! This made it a top 10 Marvel movie in words of revenue. in 2016 there was a revenue of more dan 350 million only from theaters. Looking for some more examples or do you need inspiration for your next social media campaign? Find 10 top social media marketing campaigns here. Argh! I…Just….hate it! My movie gets interrupted by boring commercials or I get bothered by other types of pushy marketing. There is interactive marketing! By making something that’s fun to watch or (better!) fun to participate, you can build a strong, memorable brand. Like the Asics campaign, I mentioned earlier. Your audience will link this activity and wonderful experience to your brand or product which will make it easier to make up their mind if they need a product like yours or it makes them feel like they need it. It is not because you read something or see something that the marketing campaign is effective. People need to go from reader or viewer to buyer. This is what we call “sales conversion” Many times this happens because of a call to action like ‘buy now’ or ‘try it now’ etc. A great example for this is the Orlando magic we talked about earlier. Because of the personalization and interaction with people, the ticket sale increased extremely. Another example of an increased sales conversion can be found at Blackbaud, a cloud software company. They had a lot of stories to tell but didn’t really know how to tell them or what do to with it. Once they figured out a way to do it their sales was 133% compared with the quota. The solution they applicated was an assessment and a calculator for their audience, so they could figure out what the followers needed. Now that is the magic of interactive marketing! Especially on social media or other online platforms, it’s easy to personalize your content. People will feel more connected with the product and will be more likely to ‘click’ on your advertisement. It gives the feeling that someone you know is talking to you. Yes, You heard it right. He mentioned his clients’ colleagues as well! Feels like they are spies to me. But it is clever! It’s pretty obvious that – especially in digital marketing – it’s easy to implement some interaction with your audience. Actually these days, you have to. That is what your customers need and what they are expecting from you as an organization.